YEKATERNBURG, February 1. /TASS/. The archive with documents and personal belongings of the members of the ill-fated team of skiers who died under mysterious circumstances in what is now called the Dyatlov Pass incident back in 1959 might be handed over to the Yekaterinburg-based Yeltsin Center Museum, Yuri Kuntsevich of the Dyatlov Group Foundation, which now keeps this archive, told TASS on Friday. "I am preparing the Dyatlov group archive for handing over to the Yeltsin Center. We have documents, photos, films, personal belongings, objects found at the incident site and the criminal case. So far, I cannot say even approximately how many documents are at our possession. Just imagine a 40x40x60 cm container and it contains documents only on one member of the team. And we have six such containers, not all of them being sorted out," he said. Dyatlov Pass incident investigators publish book unlocking its "mysteries"
The Yeltsin Center Museum has said it is ready to discuss this initiative. "A couple of years ago, the Yeltsin Presidential Center was offered to set up an exposition dedicated to the Dyatlov Pass incuident, but the idea was never realized. So far, the issue has not been discussed with representatives of the Yeltsin Center. But, in any case, we are thankful for confidence and are ready to look at details." The museum’s press service told TASS. Meanwhile, the regional prosecutor’s office has promised to organize nine more legal and forensic enquiries to clarify the circumstances of the incident. "The prosecutor’s office will conduct nine various enquiries and examinations. After that, we will be able to give more details," Andrei Kuryakov, who leads a team of experts probing into the Dyatlov Pass incident under the Sverdlovsk Region Prosecutor’s Office, said via the office’s internet channel. According to Kuryakov, it is planned to organize a forensic examination as the previous studies leave many questions. "A repeated examination will make it possible to remove a number of gaps," he said. Apart from that, in his words, a psychiatric examination will study behavioral reactions of the group’s members, both in normal and emergency situations. "We will draw a psychological profile of each of the nine members of the group based on media reports, private researches as there are a lot of interviews given by people who knew the young people. And when have all the data we will be able to consult a psychologist," he explained. More to it, it is planned to stage a kind of reenactment experiment to clear up whether the hikers could leave their tent through a knife-cut hole, whether all of them could leave it that way, etc. In February 1959, a group of nine ski hikers disappeared on the eastern shoulder of Otorten Mount (meaning Mount of the Dead in the local Mansi language) in the Sub-Arctic Urals. 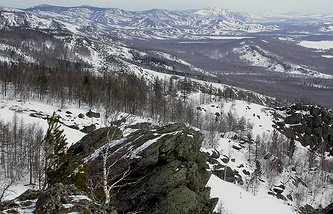 The mountain pass where the incident occurred has since been named Dyatlov Pass after the group's leader, Igor Dyatlov. All members were experienced in long ski tours and mountain expeditions, triggering a search when the group failed to make a scheduled arrival. Three weeks later, five bodies were found, some hundreds of meters down the slope from the original camp. It took two more months for investigators to find the other four bodies. Investigators at the time determined that the hikers tore open their tent from within, departing barefoot into heavy snow and a temperature of minus 30 C. Although the corpses showed no signs of struggle, two victims had fractured skulls, two had broken ribs, and one was missing her tongue. It was determined only that the deaths had been caused by "a compelling natural force." Possible explanations included an avalanche, an attack by fugitive criminals or the indigenous Mansi people, a brawl among the tourists, let alone all sorts of conspiracy and alien theorists.